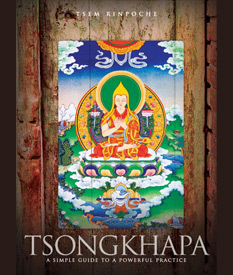 Extracted from the book TSONGKHAPA – A Simple Guide to a Powerful Practice, conceptualised by His Eminence Tsem Rinpoche who wished to introduce Lama Tsongkhapa’s Guru Yoga to spiritual seekers as this practice would benefit many. Click here to watch all four parts of the video. By our practice of the Guru Yoga, wisdom, compassion and power are attained; also, connections are made to Maitreya, Avalokiteshvara, Manjushri and Vajrapani. You will have also created a permanent link with Tushita Heaven (also known as Gaden Heaven), such that when you die, you will ascend to this heaven. These are the many types of benefits that arise from Lama Tsongkhapa’s practice. There was a wealthy upper-class family Lhasa which was been afflicted by a powerful class of spirits called Pehar. Pehar is not merely one spirit but a class of spirit. Usually, these spirits afflict only one or two people, but in this family, many family members were completely destroyed by these spirits. Finally, this family had only one son left who the spirits were frequently taken possession of. Every time he was possessed by the spirits, he would become uncontrollable. Eventually, they realize that these possessions would lead to death. Alarmed, this family contacted the great Bodhisattva, Pelden Sangpo. The family did that exactly what the Lama advised. The next time the boy was possessed by the spirits, the family members immediately placed the beads of the mala all over the house, at all the windows and doors. Because of this, the spirits could not leave our escape from the house. Everywhere the spirits went, a terrifying Yamantaka would appear. If the spirits went to a window, Yamantaka would appear. Then, when the spirits went to the door, a terrifying Yamantaka would appear again. What that Pehar legion of spirits would see at every entrance and every exit was great Yamantaka deity, and doing not able to escape. Then the great Bodhisattva Pelden Sangpo said to the spirits, “You must at least promise me that you will not harm anyone who recites the Gaden Lhagyama or the Migtsema prayers. If you can promise this, I will release you. The spirits agreed. Pelden Sangpo gathered up the mala beads from the exit of the house and as soon as he did so, the spirits were able to leave and disappear. Even today, by reciting the Gaden Lhagyama and Migtsema prayers, many classes of spirits -Including very powerful spirits such as the Pehar – cannot afflict or bother us because they have taken a vow and sworn not to do so. These spirits can take possession of people. They can enter your body, make you say or do crazy things, harm yourself and even make you pervert the teachings. They can say things to make people do negative things. They can pretend to be other deities or spirits who say good things but are actually tricking you. These spirits are very dangerous. By their taking possession of you, bothering or staying around you, they will eventually cause you to go crazy or even cause death. These spirits are very powerful but Lama Tsongkhapa’s practice, including recitation of Migtsema mantra, has the power to stop them. The highly attained Lama Pelden Sangpo has shown us the power of using at the problem using Migtsema to stop them. As prophesies by Shakyamuni Buddha, Lama Tsongkhapa is an emanation of the Bodhisattva of wisdom, Manjushri. Therefore, his practice will instill deep wisdom for the sincere practitioner. As such, Lama Tsongkhapa’s practice is especially suitable for children or students of any age, or for people in professions such as teaching, counseling, communications, media or the arts. We achieve great wisdom when we are able to understand what we need to cut off the attachments which causes our suffering, and we realise that Dharma path that we need to follow. We achieve clear wisdom when we are able to tell the difference between the subtle characteristics of the all phenomena. We achieve quick wisdom when we can clear wrong views by being able to perceive the real nature of doubts and misconceptions. We achieve profound wisdom when we are able to comprehend the meanings of the Scriptures easily and would dept. We achieve the wisdom of teaching the Dharma when we get optimally, accurately and skillfully assess and choose the Dharma to an audience according to their respective needs and receptivity. This allows us to convey the Dharma in order to best appeal to them in a logical and clear manner. We achieve the wisdom of spiritual debate when we are able to successfully put forward and defend Dharma tenets using skillful means and logic in order to clarify misconceptions from potential antagonist would have wrong view. We achieve the wisdom of writing Dharma texts when we can understand Dharma perfectly and have the confidence to write about it in order to benefit many. This also directly creates the cause for Buddhadharma to remain in this world for a long time. We can gain great compassion by the Guru Yoga practice. When we chant the first line of the Migstema mantra – Mig Mey Tze Wey Ter Chen Chenrzig, or, in English, “You are the unstained compassion, you are Avalokiteshvara, we can gain great compassion. This is because the Lama Tsongkhapa is one with Avalokiteshvara. This practice can also help us to gain power. Invoking the blessings of Vajrapani is supreme for people who are scared, who do not have a lot of courage or power. Also, if we find that when we teach the Dharma, people find it difficult to understand or perceive the Dharma, Vajrapani can make our speech powerful. Vajrapani is the supreme Buddha for controlling people’s delusions and illusions by wrathful means. As Tsongkhapa is also one with the Vajrapani, doing this practice will help us create a very powerful connection to Vajrapani, the 1000th and the last Buddha to appear in this fortunate eon. Vajrapani will appear after the 999 Buddhas of this eon have left and he has promised to teach everything that the 999 Buddhas would have taught. Shakyamuni was the fourth Buddha of this fortunate eon. The next Buddha to appear on our earth is Maitreya Buddha who will be the fifth; he will then be followed by the sixth, seventh, eight, etc. until the 999th Buddha. If we are still on the beach having a good time (hopefully as human beings) at the time of the 1000th Buddha, we stand a good chance of receiving this teachings and attain Enlightenment then, because we are making prayers to Vajrapani, the 1000th Buddha, now. Vajrapani is also known as ‘Holder of the Secrets’, which refers to the Tantric teachings. Those who connect with Vajrapani through Lama Tsongkhapa will have a particular affinity to understand and practice correctly the higher Tantric teachings that Vajrayogini, Yamantaka and Guhyasamaja. Lama Tsongkhapa’s practice is very calming, and very effective for pacifying all minds and environment. Any obstacles to a long life-such as the defilements of hatred, ignorance and desire, which create negative karma for us and decrease our life span – will be removed by Lama Tsongkhapa’s practice. His practice also lessens our delusions by allowing us to collect merit, which in turn will support and propel us further in the spiritual practice. Lama Tsongkhapa’s practice confers great blessing upon us. When practicing Lama Tsongkhapa, we gain great wisdom, great compassion and great power to overcome the delusions. Therefore, negative karma does not arise as much and becomes less. The negative karma which we collect previously – in this and previous lifetimes – becomes purified, and therefore, as a result, our suffering reduces. Lama Tsongkhapa’s practice also includes the practice of powa. Powa is an advanced meditational practice which allows the controlled transference of consciousness at death. There is powa practice in all the four lineages of Tibetan Buddhism. It is very strong in the Kagyupa lineage; they follow the Amitabha path and practice. This is also very strong in the Sakya lineage, wherein they follow of Vajrayogini path (also known as the Naro Kacho lineage), with the Six Yogas of Naropa. Contained within the Vajrayogini path is the powa practice. People who practice Vajrayogini and Lama Tsongkhapa are very fortunate. When they die, they will be able to choose whether they wish to ascend to Vajrayogini’s heaven or Lama Tsongkhapa’s heaven! In any case, people who practice these two lineages are very fortunate because wit Lama Tsongkhapa’s practice alone, you will definitely be able to go to Gaden Heaven. When you are reborn in Gaden Heaven, you will be born just as in Amitabha’s Heaven, Sukhvati – from a beautiful lotus. In Gaden Heaven, you will be born in front of the great, golden Maitreya. Thus, this practice gives us a very strong connection to Maitreya Buddha. When Maitreya Buddha appears on earth in Bodhgaya in the future, we will also be reborn there, especially if we pray now to be his closest disciples in future. However, unlike other powa practices that can shorten your lifespan so you can ascend to a particular Buddhists heaven quickly, Lama Tsongkhapa’s practice does not do that but creates a strong connection to Maitreya so we live our lives to a ripe old age practicing the Dharma. Then we die and ascend to Tushita heaven. Even if we do not wish to go to Gaden Heaven, then, Lama Tsongkhapa’s practice will still help us to take rebirth again and again to “come back” to the many different realms of existence to help and benefit other sentient beings. By Lama Tsongkhapa’s practice, we gain this ability to engage in powa practice, which will allow us to “choose” where we go and/or how we can come back to continue a spiritual practice to benefit others. Powa practice is excellent. Lama Tsongkhapa’s practice will protect the practitioner from three types of obstacles – outer, inner and secret. The outer harm that Lama Tsongkhapa protects us from is harm from humans, non-humans, elemental forces such as floods and fire, bad weather and accidents. Lama Tsongkhapa will also ensure that you have the necessary physical conditions to engage peacefully and successfully in spiritual practice such as time, money, food, a conducive and comfortable place to stay, finances, etc. Protection from any obstacles means that this practice will help to prevent sickness of delusions, including wrong views and negative thought. Lama Tsongkhapa’s practice lengthens and stabilizes your life, and improves your health. It will also cure disease like the drib disease or the physical disease caused by spirits that makes people fall and become unconscious without visible reasons. This is similar to epilepsy. I have heard many times the people who suffer from very bad health were recommended to do the Migstema practice. Lama Tsongkhapa’s practice also protects you from secret obstacles Enlightenment. Secret obstacles are grasping onto ordinary appearances or ordinary conceptions and grasping onto dualistic appearance. Dualistic means seeing things and holding onto their having dualistic nature; that is, good and bad, white and black, pleasant and unpleasant. Secret obstacles also arise as wrong views, having doubt in our teachers or the spiritual path that we are following and being led away towards views or practices that will prevent or distract us from attaining Enlightenment. With Lama Tsongkhapa’s practice, you can also avoid harm from weapons. When you do his practice well, you will not be harmed even if people throw knives at you or shoot at you. In Tibet, many of the nomadic people there carry gaus with them as they travel. These are Tibetan Buddhist protective amulet containers or prayer boxes, which contain hold Buddha images as well as precious relics and items from their Lamas. There are many stories in Tibet about people who hold up an image or tsa tsa (small clay Buddha image) of Lama Tsongkhapa inside a gau when they are shot at and the bullets are actually deflected. When people wear of carry such Lama Tsongkhapa gaus, and have to escape, fight or fend off physical attacks, they are protected by the blessings of Lama Tsongkhapa. Lama Tsongkhapa’s practice can definitely grant protection from weapons or physical attacks. That is if you practice sincerely and well. It would be crazy to just recite Migtsema mantras and then run in front of terrorists and say, “Shoot me!” You might find that you get to Gaden Heaven very “quickly!” (or you might not even make it to Gaden Heaven…). However, Lama Tsongkhapa’s practice can definitely protect you from thieves and robbers. Lama Tsongkhapa’s practice can also pacify obstacles to growing crops. For example, you can get rid of pests by Lama Tsongkhapa’s practice. His practice will also always help you to find food if you have difficulties obtaining food. It can also help us to maintain our jobs, careers and businesses that sustain us. If you take refuge and visualize Lama Tsongkhapa, do the Gaden Lhagyama practice and recite Migtsema before you travel, a lot of obstacles for your journey will be pacified. Reciting the Migtsema mantra gently and then blowing on our beloved pets invokes the blessings of wisdom, compassion and protection for them. Blowing any kind of holy mantras on animals plants karmic imprints into their minds. These imprints can bless them to gain a better rebirth in the future, and to obtain the ability and physical faculties to comprehend, absorb and practise the Dharma to gain attainments and freedom from suffering. Recite Tsongkhapa’s scared mantra Migtsema 21 times or more and think deeply that the mantra bestows strength, wisdom and the mind of Bodhicitta, great compassion and altruism. Then, after you have recited the mantra, blow directly onto the vitamin pills. After blowing the mantra, close the cap, and think that the vitamins are blessed with Migtsema. You can then take these vitamins daily, which have blessed by the energies of strength, wisdom and compassion, embodied by Lama Tsongkhapa. Helping our parents by feeding, cleaning, serving and talking to them is very good. Service to them in this way helps them in this life. However, for the benefit of their future lives, we can either sponsor or create Lama Tsongkhapa images in dedication to them. We can dedicate our sponsorship or creation of these images towards our parents’ future lives, with the prayer that they may always be connected to Dharma practice, learn, practise and gain attainments towards Enlightenment. Then, for every moment that the images exist and benefits beings, the merit and positive prayers that we have made for our parents will continue to be generated over and over. This would benefit them forever. If you do Lama Tsongkhapa’s practice, follow Lama Tsongkhapa’s advice and his teachings, which include Lojong, Lamrim and Mahamudra, combined with the 50 Verses of Guru Devotion, you can and will gain Enlightenment. The Lojong or mind-transformation teachings have been further explained by the exalted masters Geshe Sharawa, Geshe Chekawa and Geshe Langri Thangpa. These great Geshes, or great Masters, explained the mind-transformation teachings along with the Lamrim and the Mahamudra, which are the teachings on Emptiness. These three teachings are the essence of Lama Tsongkhapa’s practice because they will take you to full Enlightenment. Out of the millions of teachings given by the great Buddha, Lama Tsongkhapa distilled the essence that would be best for people at our time, in our situation, with our karma. Extracted from the blog of His Eminence Tsem Tulku Rinpoche and the Tsongkhapa Boxset.